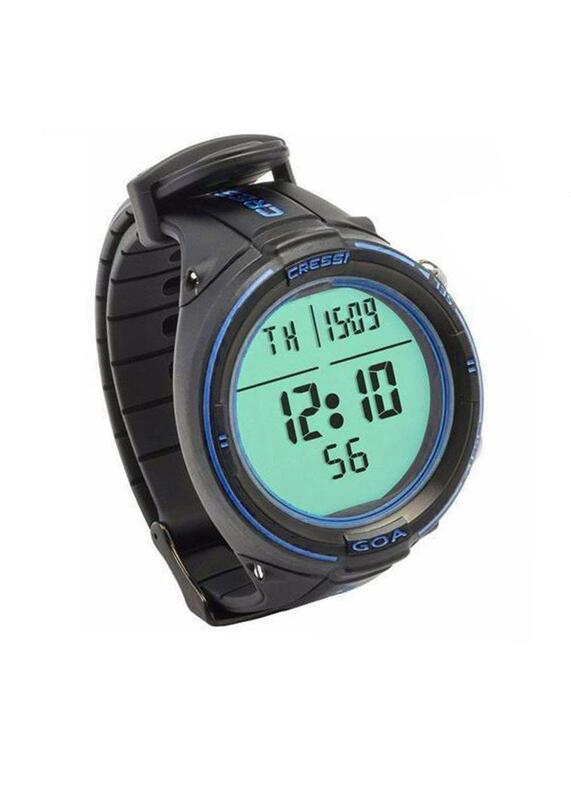 The Cressi Apnea programs offer a display of all diving parameters such as depth, temperature, dive calculator, maximum dive depth, dive time, length of surface interval between each dive, and length of diving session. The apnea program also provides depth, dive time, surface interval alarms, recovery time alarm and visualization of time at dive phase. Simply put, all the features most popular for spearfishing and freediving with options to set the alarms on or keep them off. Our Cressi Black/Blue Goa Dive Computer is a super small and compact dive computer with a diameter of only 1.89" (49mm) which showcases a high contrast display and large easy to read numbers. The GOA is also the perfect tool for other underwater activities, thanks to the deactivation option of the dive" functions that avoids unnecessary alarms ringing while you're snorkelling or swimming. The display is made of mineral glass and the case is heavy duty with steel buttons. The computer/watch is depth rated up to 394' (120 meters). The Goa computer comes with a rubber wrist band with stainless steel buckle and has a plastic/steel bezel and back cover. The display has been crafted from mineral glass and the case is heavy duty with steel buttons. The computer/watch is depth rated up to 394' (120 meters). The Goa computer comes with a rubber wristband with stainless steel buckle and has a plastic/steel bezel and back cover. The display is made of mineral glass and the case is heavy duty with steel buttons. The computer/watch is depth rated up to 394' (120 meters). The Goa computer comes with a rubber wrist band with stainless steel buckle and has a plastic/steel bezel and back cover. The display has been crafted from mineral glass and the case is heavy duty with steel buttons. The computer/watch is depth rated up to 394' (120 meters). The Goa computer comes with a rubber wristband with stainless steel buckle and has a plastic/steel bezel and back cover. Not only is this little computer tough it is so user-friendly and easy to use with it's easy to find the menu and the capability to switch between 12/24 time formats at the click of a button. This Computer also features a precision stopwatch, second time setting, alarm clock and backlit display for reading the computers functions in low light conditions. Surface time, desaturation and no fly time calculator, lets you know when battery is low and can provide metric or imperial units of measure. Computer has a 50 dive per category memory logbook function.